This stunning and elegant pair of table lamps were realized in Murano, Italy- the island off the coast of Venice renowned for centuries for its superlative glass production. They feature faceted bodies- like oversized cut gemstones- in a gorgeous dark sable hue with brass fittings. With their clean modernist lines and refined color palate, these table lamps are as versatile as they are beautiful. 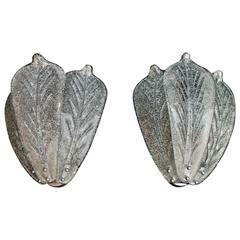 They would be a winning addition to any style of interior from classic Mid-Century Modern to contemporary. They have been newly rewired to American standards and are in excellent condition. They come fitted with custom shades. Italy, 21st century Dimensions: 20.5" height x 6.5" diameter Shade: 11" H x 16.25" W x 11" D.
Multicolored Murano glass lamps mounted on black lacquer and brass bases, attributed to Barovier & Toso. Pair of Murano glass lamps, with mercury glass centres, overlaid with thick, crystal clear glass, signed Alberto Dona Murano. Height of just the glass is 15.75 in. Rewired for the US. 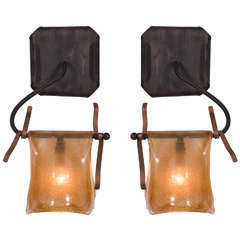 Pair of handblown Murano glass sconces on iron brackets, one light in each one and lovely masculine style with dark oil rubbed finish on the metal. 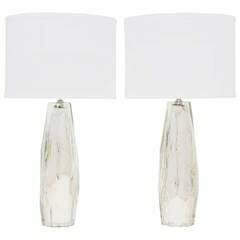 White and clear mottled lamps in handblown Murano glass with original painted metal necks and bases, circa 1970. Measurements below are too top of socket. 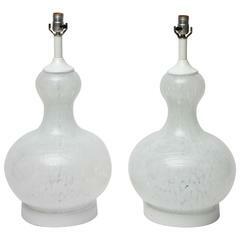 Pair of handblown white striated glass table lamps with polished brass bases by Vetri D’Arte, Murano, Italy, 1970s. Both retain original Vetri D’Arte labels.